The Department of Economic and Social Affairs (UN DESA) holds up the development pillar of the UN Secretariat. 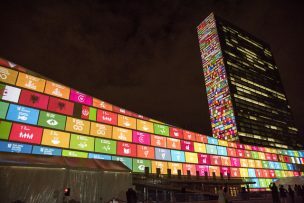 It provides a vital interface between the global policy debate on economic, social and environmental issues in the General Assembly and the Economic and Social Council (ECOSOC), including its subsidiary bodies, and national action. The Department promotes and supports international cooperation in the pursuit of sustainable development for all. Its work is guided by the 2030 Agenda for Sustainable Development and its associated 17 Sustainable Development Goals (SDGs) and 169 targets, the Addis Ababa Action Agenda on financing for sustainable development and other relevant internationally agreed global frameworks. UN DESA’s programme of work focuses on three main streams of activities: norm-setting by facilitating major global conferences and summits and helping countries find common grounds to take decisive steps forward for development; data and analysis, by generating, analyzing and compiling data and information, providing statistical trends, research and analysis on economic, social and environmental issues to support national decision-making; and capacity development by providing policy advice and technical assistance to help Governments transform global commitments into national action. In Capacity Development, UN DESA builds on its global perspective, networks and extensive knowledge and expertise to assist Member States translate the global policy frameworks for sustainable development into national strategies and programmes and to effectively monitor progress.